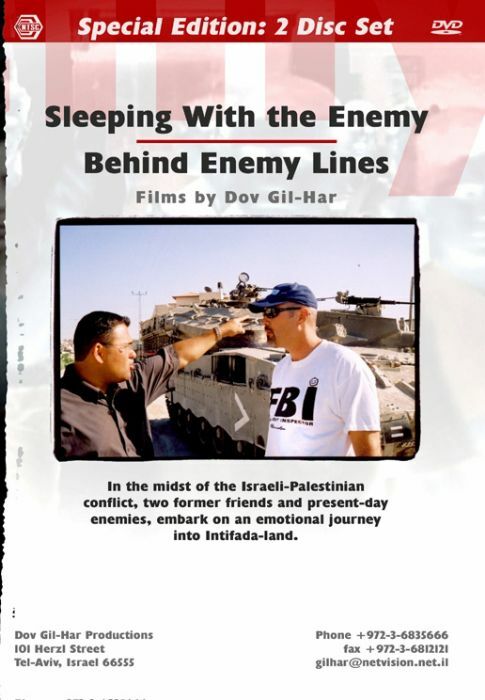 Sleeping with the Enemy - Israeli filmmaker Dov Gil-Har documents, in his first film, the initial acquaintance of Benny and Adnan on a joint peace mission to Japan during pre-Intifada days. While embracing the "Tokyo Spirit" of understanding the two vow to take home a message of peace. Soon after their return the second Intifada erupted. Behind Enemy Lines - four years later, frustrated from years of brutal violence, Gil-Har reunites his two protagonists. In an emotional and dramatic quest through the milestones of the conflict, Benny and Adnan try to convince each other in their own truth. Jenin refugee camp, terror ridden Jerusalem, the disputed Temple Mount, and the family of a suicide bomber are only a few stations of their weeklong journey. Benny is already a settler and heads a police commando unit who combats Palestinian militants. Adnan's cousin was killed while on a shooting rampage in the heart of Tel-Aviv. Despite the huge gap in their political perspectives the two former friends try to find ways to communicate and rebuild the lost trust. (2004, 52 minutes).